Fall is fast approaching. No matter how much we may wish to pause time and reap our summer garden harvest we have to start thinking about the fall garden. This weekend I redid and rebuilt one of my garden beds to update it for fall crops. 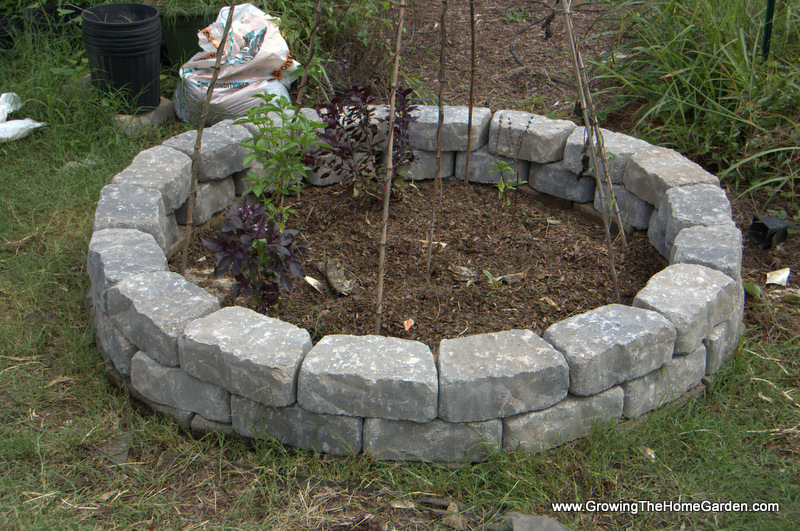 If you’ve followed me for a while you may remember the raised circular garden bed I made with retaining wall blocks. With the help of Lowe’s Creative Ideas I completely revamped it and prepared it for the fall crops. Here’s where it was before. The stones had sunk some into the soil and weeds had crept in all around. I weeded and re-leveled the stones before beginning the “real” project! I brought home 36 retaining wall blocks from our local Lowe’s in Spring Hill, TN. On the level base provided by the stones I had there previously I set the first row of blocks. I adjusted the spacing of these these blocks as I went and had to go back over it a couple times to get them adjusted how I wanted them. 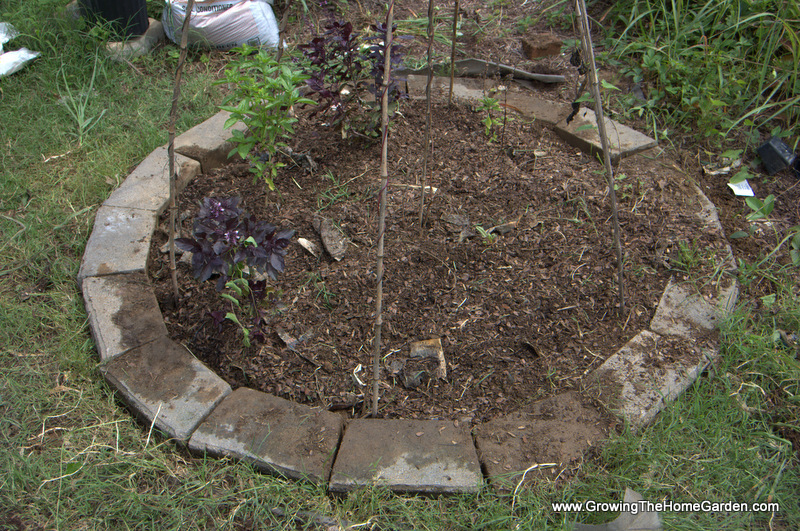 The spaces between the blocks needed to be small enough to prevent soil from leaving the circle but also needed to be adjusted so that the circle fit the space. Once the first row was set I staggered the second row of block and completed the raised bed walls. Then I layered the soil with a weed prevention method. I used newspapers which eventually biodegrade but you could use landscape fabric too. Then I filled the beds with a mix of soil. I added 5 bags (1 cu. ft.) of compost and 2 bags (2 cu. ft.) of soil conditioner. 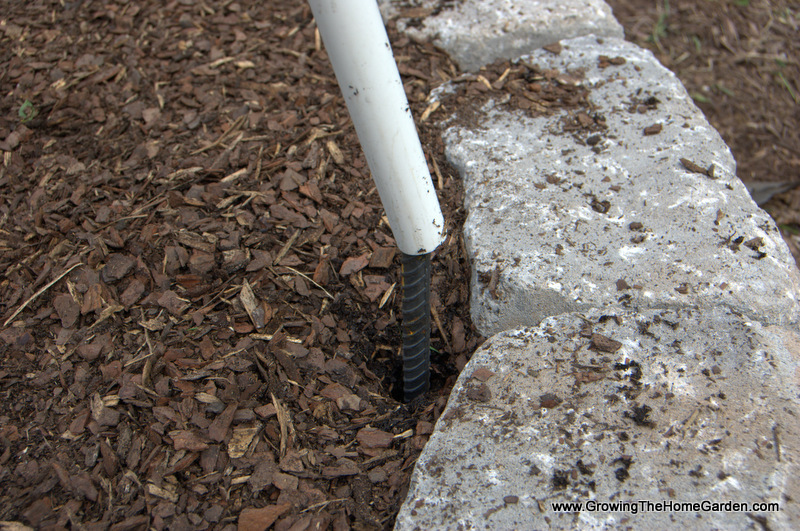 The soil conditioner keeps the soil from compacting too much and provides drainage. Eventually it will break down and feed the soil. The compost has easily accessible nutrients for the plants. I left my basil in place and buried portions of it below the soil. Basil will root along the stem kind of like tomatoes and should be fine in this situation. Next I installed a deer prevention strategy. I have had big issues with deer in my garden this year. You name it, they ate it! To make sure they didn’t eat my fall garden I installed 4 – 18″ pieces of rebar. Then crossed two 10′ pieces of PVC pipe over the bed to create a dome. The rebar made excellent stakes for the pipe. Over the dome I put bird netting. It’s labelled as bird netting but I’ve found it impedes the deer effectively. 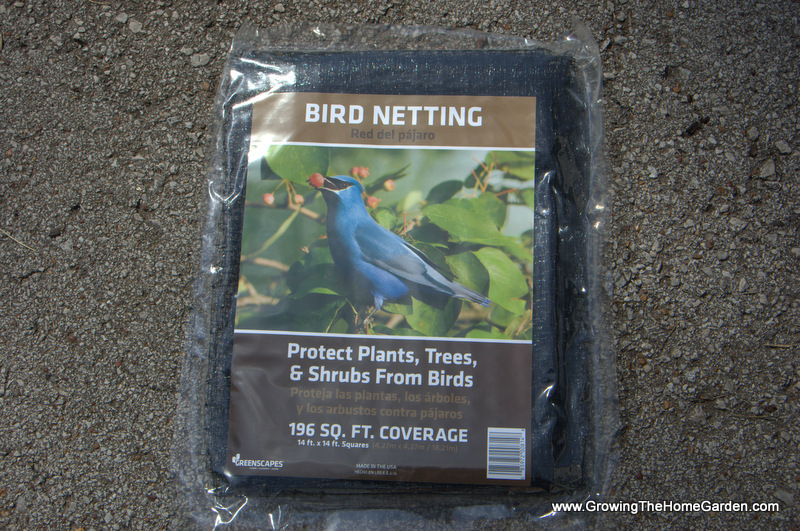 They tend to graze on the easiest to find vegetation and should be deterred by the bird netting. Now it’s ready for planting! There are all kinds of fall greens that can be planted in the garden. Spinach, chard, kale, lettuce, broccoli, Brussels sprouts, and many others. 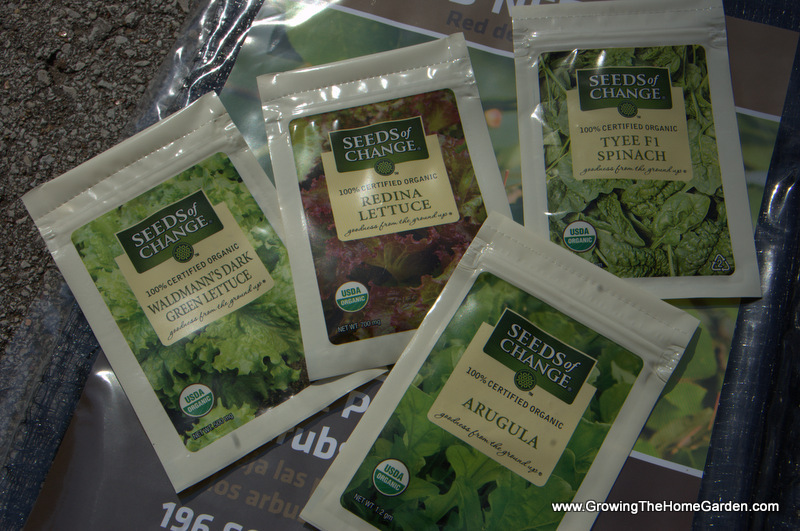 I bought a few packs of Organic Garden Seed from Seeds of Change there at Lowe’s to grow in my garden. So far I just have lettuce started. The other seeds I’ll start in biodegradable starter pots. This project from start to finish was completed in one afternoon. 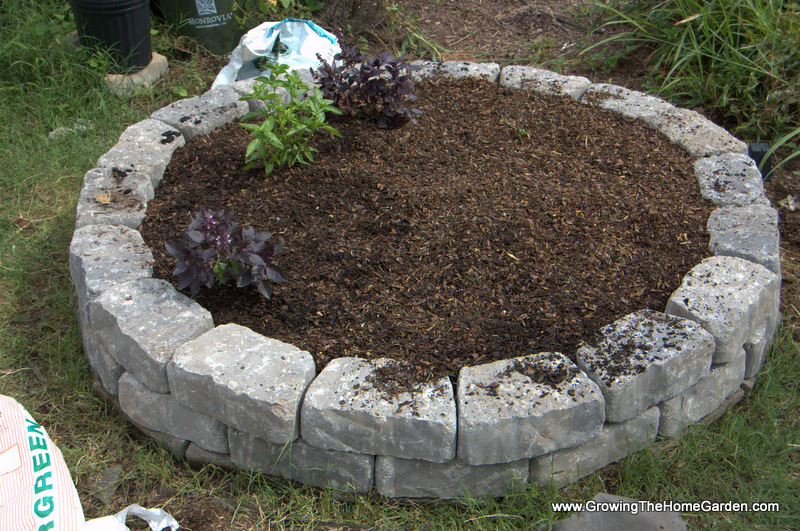 You can use these blocks to create flower beds for any season. Try a raised block garden for fall flowers by planting with mums and asters and inter-plant with a few of your favorite veggies! 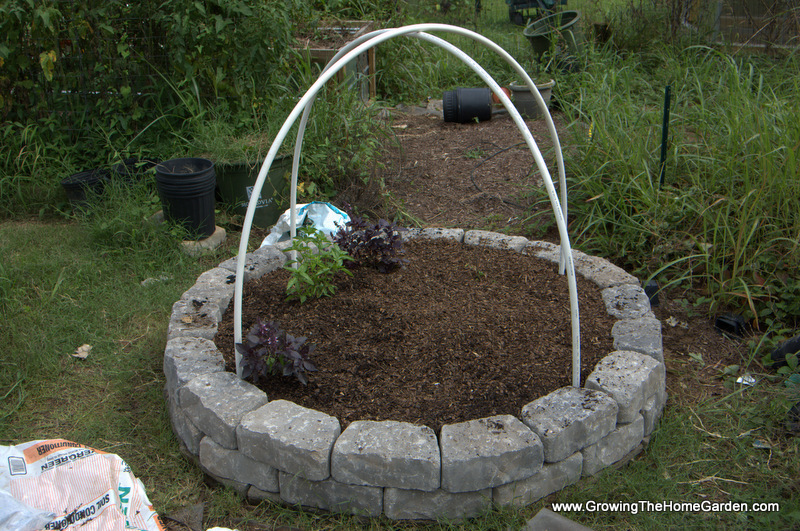 Now I have a great looking circular garden bed ready for growing our crops this fall! Looks great!! I love your deer-excluding dome. Simple and hopefully effective. What is the diameter of the circle you used? Thanks!